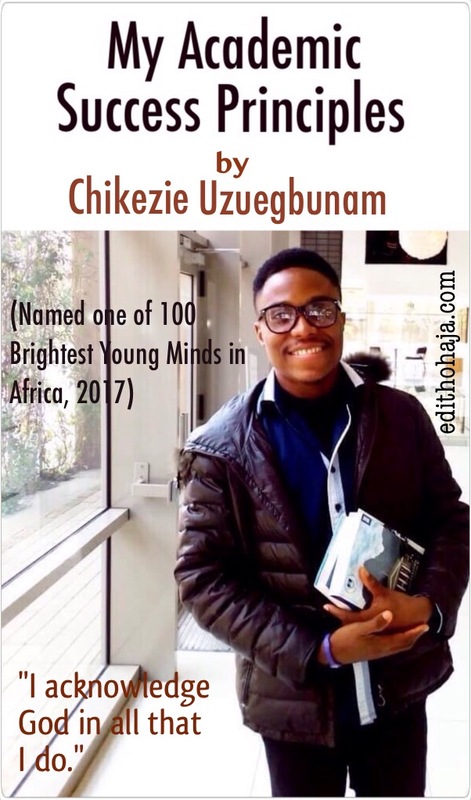 In 2017, Chikezie Uzuegbunam was named one of the 100 Brightest Young Minds in Africa. He also gave a TED Talk to top Business Executives/Communicators in the 2017 edition of the MasterClass conference by the International Association of Business Communicators (IABC, Africa Region).These recognitions came as no surprise because the 30-year-old’s numerous research works have been published by such renowned publishers as Routledge, Taylor & Francis, Intellect and Cambridge Scholars Publishing. Chikezie, who was Best Student in Media and Communication at every previous level of study (diploma, bachelor’s and master’s degrees), is currently a doctoral scholar and teaching assistant at the University of Cape Town’s Centre for Film and Media Studies. He is also a lecturer at the Mass Communication Department of the Nnamdi Azikiwe University, Awka. In view of the foregoing, I requested that he share with my readers his Academic Success Principles and he graciously obliged. What we, therefore, have in this guest post are not ideas borrowed from here and there but standards that have actually worked for Chikezie in his own endeavours. As expected, his writing is lucid and engaging. You will also find more than a few profound quotes in it. It is long but I was loath to break up such a beautiful and important piece into parts. I am confident that this post will be a great blessing not only to students and teachers at all levels but to others who desire success in fields beyond academics. A whale of thanks to Chikezie. May God continue to take him higher and use him to bless many in Jesus’ name. More information about him is available at the end of this post. Do join the discussion after reading and kindly share the post on various social media to benefit others. In today’s world where people aspire to be politically-correct, where status-quos continue to be challenged and stories of people who “dropped out of school to become millionaires” fly, such things as academic success continue to be questioned and discarded by the younger generation. Education is increasingly becoming an endangered norm. To these cohort, it is no longer “fashionable” to go to school; money can be made outside citadels of learning and money is what the world needs. The major challenge isn’t that academic excellence has seemingly gone out of fashion, it is a deeper question of a generation that is unprepared to play by the rules; a generation of impatient people; a generation of shortcuts and of unhallowed hastiness. People want to make it in life without stress: students want to pass exams and get degrees without going through the process. People want to be successful by dubious means; no longer is hard work extolled. Many want to bypass the process and get the product. They want to get the glory without understanding the story behind the glory. From my experience travelling the world, this problem isn’t context-specific, it is rather a common pattern found in the younger generation, from Africa, Asia, to Europe and the Middle East. Everyone wants a stress-less life. People seldom want to do the “dirty” hard work. Youth are becoming academically lethargic and among the millennials, there is little drive for success, as many are continually distracted by a whole lot from digital technologies and the Internet. Again, society is too fast-paced to pause and notice the deep sense of loss felt by many young people, and one in which they are expected to make it through hell or high waters alone, to figure things out by themselves. I am very gratified to say that education got me where I am today, but with a great dose of God’s grace and favour. Academic excellence is not a congenital trait. It cannot be inherited. It is not a virtue that I acquired naturally; I worked it out. Academic excellence is more than just achieving good grades; it is equally, maximum development of your intellectual capacities and skills. Academic excellence comes with a price, only those who understand its worth can pay for it. My academic success principles may not be anything fascinating, but when you consider that these same principles that I am about to share, have within a decade, changed my life, made me a fulfilled young person at 30, brought me before prominent people, given me international visibility, then you might just begin to think again, to ponder on these things. I promise not to sugar-coat anything but to simply be downright honest. One of the first and amazing things God did for me and which had a direct impact on the extent to which I became academically successful, was my discovery of what I was created to become. Once I was able to realise this by the help of the Spirit of God, through a series of events in my life – including a surreal childhood and my father’s demise when I turned 15 – I was able to define why I wanted to go to school, why I wanted to go in for the long haul. If you do not define why you want to go to school, and how education fits into the Big Picture of your future, you’d struggle. I acknowledge God in all that I do. We live in a world that believes attributing success to some unseen God somewhere is plain stupid and trivialises the essence of hard work in the equation of life. I am a staunch believer in hard work. In fact, I often would say that Christians who go to church to shout Hallelujahs and “claim” miracles and breakthroughs and go home to sleep, are plain foolish. I completely understand that without hard work and committed discipline, success would remain a pipe dream for many of us. However, when I consider that there had been times I worked so hard, when all I did was work and not play, and yet, I needed some sort of spiritual endorsement to push through with something major, I realise that Christians cannot afford to keep God’s favour and grace out of the equation of life if they must get ahead. Success is a lonely place, a lonely journey. Successful people – in whatever endeavour – are those with very few friends, and the same could be said of me. In fact, my experience with friendship has been truly odd. From childhood, it has always been difficult to keep friendships with age mates; I have always been drawn to older people. Those days, I would cry, and I’d feel terribly lonely because I could not get the bond I needed with my contemporaries. Today, I know better – God was preparing me for the future ahead. I accomplish more when I am alone; not when surrounded by people, by friends. Time management is key. In the fast-paced world in which we live, time management has become quite far-fetched for many, especially young people. With mobile digital devices enough to sway our attention and to keep us “hippy”, millennials are always caught in the web of prioritising the wrong things. Time spent on the Internet and social media robs us of the discipline and capacity to give attention to important aspects of our life. Time management is self-control, and the Bible says that a person without the latter is like a city without walls. Time is a gift from God, and if you waste it doing immaterial things, you sin. Proper time management is what distinguishes excellent and successful people. Time wastage occurs when there is no vision and focus. When this happens, time becomes a burden, instead of a tool. It pays to go the extra mile. Going the extra mile means going beyond the norm, beyond what is convenient and ordinary. Stars shine at night and not in the day. If you desire to be a star, then you must get ready to shine in the night, to work hard when others are sleeping, when others are seemingly enjoying life. By going the extra mile, I also mean going beyond and above what you are taught or given, to self-learn. The Internet is a huge learning resource; however, it remains largely under-utilised. Education is free on the Internet, but lack of desire makes it costly. Submit yourself to mentorship. Find, submit to, listen to and learn from people who have been where you want to go. Benefit from their experience, advice and guidance. Choose your mentors wisely and try to develop a real, beneficial relationship with them. Good mentorship is hard to find these days as either the mentors are too busy and impatient to guide anybody, or the mentees are unavailable and too self-conceited to submit. One of my greatest secrets to success is that I surround myself with mentors more than I do with friends. The Bible says that in the multitude of counsel, victory is guaranteed. Finally, but far from being the least, be a possibilitarian – expect the best from yourself, always. Keep a positive attitude. Do not go about with a long face expecting something bad to happen or your plans to go askew. Pursue that dream with vigour and a positive outlook. A depressed heart dries up a person’s life. The joy of the Lord is your strength all the time. Celebrate your small breakthroughs while striving for the big ones: do not despise the days of small beginnings. I always pull off a special thanksgiving in church or secretly whenever I achieve anything in my life. God is happy when you do this, and He’s moved to do more. Nelson Mandela once said: “Education is the most powerful weapon which you can use to change the world.” I strongly believe that knowledge is power, and the use of that knowledge is even greater power and greater force to change your life and the world. Most people are often afraid to chase their dreams. For me, I constantly live in fear of not even trying, and so I always pursue, to be better than I was yesterday. God is intentional with each and everyone of us because He takes care to build into us gifts and talents we would need to succeed in our life. Discover yours, and go to school to polish them. Perhaps the problem is your fear of failure? Hear this: There is strength in you that you never dreamed of. There is understanding in your brain that you never believed possible. I share with you one of the greatest words I’ve ever heard, by Samuel Beckett: “Ever tried? Ever failed? No matter. Try Again. Fail again. Fail better.” Welcome to Success Land. You get here by no other means. I am a lover of Jesus, a lecturer, a PhD scholar and a mentor. My family background and an early thrust into the world of responsibility, got me thirsting after the fatherhood of God, Christ’s saving help, and the friendship of the Holy Spirit. My life became filled with meaning afterward and I would later pursue my life vision and goals with such vigour, grace and passion as have surprised me and those around me. Besides honouring God through my secular work, I desperately yearn to see young people of my generation become their fullest selves. As a proud product of keen mentorship, I run a youth mentoring clinic and use the same platform to bring hope and succour to young people, especially in Nigeria. I am a media opinion writer and my works have appeared in several online and traditional media platforms. To view some of my works, feel free to go to my Academia profile. My Facebook page is Chikezie E Uzuegbunam Professional. You can also learn more about me and my work by checking my profile on ResearchGate and Google Scholar. May God help you attain the heights you desire in Jesus’ name. Hi Chime! That part really struck me too. That's why I used it on a graphic. Thank God for Chikezie. All gjory to His holy name. Chikezie, you just woke me from intellectual slumber! May God through his grace, sustain you in success. God bless you so much, dearest aunty for relentlessly blessing us with enriching messages. Amen and may God announce you the way He is announcing Chikezie in Jesus' name. Indeed a young mind of excellence! I pray that God help me to work diligently in the parts I have today decided to follow toward achieving far more than before. Ms Ohaja, all thanks to you for not just being my lecturer but also a mother. May the Lord lift his countenance upon you amen. Chikezie I see you reaching heights. Amen to your lovely prayer. May God help you to soar as well in Jesus' name. This piece is an intellectual eye opener .I have not been doing some things right. I need to rediscover and re-brand myself... Thanks so much Chikezie..thanks ma for this post...God bless you. Thank you too. May God guide you in reprogramming yourself academically in Jesus' name. Am really astonished by this. As i read down his principles, it was as if he was actually talking to me in particular. Am really inspired by the words of CHIKEZIE. Like he said, until we discover the purpose God created us for and what HE wants us to be and why we want to go to school, we will always find education to be a waste of time. Thank you Chikezie and more thanks to you Ma for feeding us with such nourishing words. You have been a blessing to us through your words of inspiration and advice. God Bless You Ma! This is so touching! God bless you abundantly, Tochukwu, in Jesus' name. I remember clearly stating that I couldn't wait for Saturday. I thank God for the gift of life to witness this post. Now I believe him when he said that he doesn't hoard knowledge. This is a vivid evidence. This is an educational post written by someone of high intellect. I ask for God's strength to apply these principles in my life in order to be an achiever. God bless you Chikezie for your wonderful piece and also Ma Edith for the platform you created to access it. Amen and amen in Jesus' name on all three petitions. You are a winner, Benita! Just can't stop going through his profile. A young and vibrant youth........if wishes were horses..........I pray to see Chikezie soonest, because we have a whole lot to do. I love these words: "Education is free on the Internet, but lack of desire makes it costly." People need to be educated more on this. Nice one dear friend to be known soon. Wow! So many insightful observations in the post, right? Praise God! Amen. May God keep you on that right track to distinction in Jesus' name. I'm so glad for this piece is an eye opener. This is what i need to be successful academically. Thank you very much, Mr Chikezie, you've really helped a lot...i'm motivated. Happy to hear that. Glory to God and blessings to you in Jesus' name. 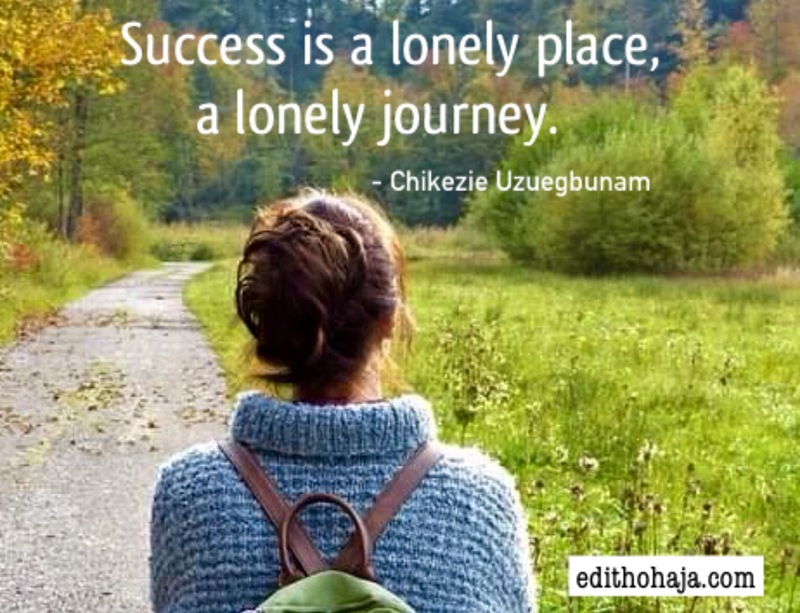 Success is indeed a lonely journey! Sometimes one is left with the feeling of abandonment, but the drive and passion to succeed keeps the ball rolling. Thanks Chikezie for sharing your experiences. It will sure inspire most youths of this generation who are becomingly beclouded with the 'get rich quick' syndrome and the craze to get to the top without hardwork. Thanks a lot, Martha! That is our prayer. You are super blessed in Jesus' name. Highly motivating and inspirational. You just fueled my desire for academic sucess! I like that! So, go and succeed in Jesus' name. This is one of the most inspirational write ups I have read in a long while. Our generation needs this as it will help to reposition them in their lives in general. Kudos Chikezie, you are a blessing and may God's grace be with you. Amen. Abundant grace with you too in Jesus' name. Maybe not a workaholic but hardworking, yes. Sleep tight, Daniel! This is highly educative. Especially now it seems academics isn't necessary anymore. I learnt a whole lot to be put into practice. I'm sharing this ASAP. Thanks Ma for this guest post. You never fail to deliver. Praise God! And a bouquet of thanks to the writer, Chikezie. This piece is seriously on point. You are richly blessed in Jesus' name. This is very motivating. In fact, I am so inspired and very grateful that I have the opportunity to read this. I pray that God gives us the grace to apply these principles. Thank you very much Ma for loving us this much to inspire us this much. Our generation will never forget you. God Bless you bountifully Ma. Amen and God bless Chikezie for taking the time to do this treatise for us. You are lifted, my dear, in Jesus' name. Thank you for this inspirational write up. Indeed it's an eye opener from a young mind of excellence. THANK YOU. Yes, it is, praise God! May you find success like the writer in your own endeavours in Jesus' name. This is a great motivation and reminder to young people... It is true that we hear similar things often times but hearing it from different people from different spheres of life who have achieved great things gives me a kind of motivation to do more and put in more effort. Life is full of complications and sometimes we forget our purpose and visions in life or we get carried away by different things ranging from peer influence (too many friends), social media influence and many other things that serve as distractions. Posts like this are necessary from time to time to remind us of the way ahead and keep us focused. A million thanks to the writer for sharing this wonderful piece with us and to my able lecturer (Edith Ohaja), thanks to you for this platform and for touching our lives...I'm really blessed and privileged to be here. Remain blessed. May God give you the presence of mind you need to apply yourself sufficiently to things that matter in order to excel in Jesus' name. This one got to me...stars shine at night and not in the day. if you desire to be a star,then you must get ready to shine in the night,to work hard when others are sleeping,when others are seemingly enjoying life. Thank you chikezie for this great piece. I have been awoken from intellectual slumber really. And to you ma. Thank you so much for bringing this write up our way. You've been of immense help. may heaven reward you. Amen. May you shine in your generation in Jesus' name. This post is really wonderful and inspiring. "Discover who you were created to be and why you want to go to school". This really interests me. Everyone has a purpose in life and realizing this i believe is a great step to success. I also love the" extra mile" part; it takes will, determination and focus. May God grant us strength to work towards being successful. Thanks a lot for this!! This is an inspiring message. Most youth of nowadays worship money and see money as the greatest thing ever. Some would go to dangerous means just to get it. This post talks to everyone, it speaks to those who see education as nothing due to the fact that they have friends who are into business making money, it speaks to people who have failed and want to quit, it also speaks to people who don't want to try new things due to fear of failure. This post leaves an important message to anyone who reads it. Wait... Really a nice piece a big thanks to Chikezie I learnt a lot . He pointed out d major problem that prevents youths from hard work and desire for academic success (internet) Thanks MS Edith Ohaja for ur platform. This is an inspiring post. I want to congratulate Mr. Chikezie. I thank you, Ms Ohaja, for sharing this with us. So many youths need this kind of inspiration to help their academic growth. 'Success is a lonely place, a lonely journey' Everybody's destiny is in his/her hands. To be successful in life, you must believe you can do it. Such an achiever! To think he did it all at a young age. Education, indeed, is the key that opens many productive doors in a person's life and more productive doors would be opened when the person fears God. May God see us through in all our endeavors, Amen. Extrememly inspiring. You can quickly tell how original this piece is as it is based solely on his experiences in school. Nice use of quotes too! Essential read for everyone regardless of where we believe we stand in our academic journeys. It's not just enough to say, "Knowledge Is Power" but, "Organized Knowledge Is Power." And that is a vital point Chikezie is trying to prove. I'm grateful for the knowledge acquired by reading this important post, that success appears a hard nut to crack but with hard work, and trust in God it is always within reach. Big thanks to aunty Edith for sharing such a beneficial message with us. Indeed it takes a determined mind & one that knows God to succeed in one's endeavour; this can be seen in the life of Mr. Chikezie; as quoted above by Nelson Mandela “Education is the most powerful weapon which you can use to change the world" this is true & by God's grace I believe we will all make it. Thanks for this amazing post. 4# share your knowledge really is so true, when you share you gain too. Ever tried? Ever failed?? No matter what, try again, fail again, fail even better, success is achieved no better way. Mr chikezie has really touched lives with inspiring words and actions. Thank you Ma for being a blessing and a means of exposure to Christ. God bless you. I am very much impressed by this writeup as it teaches us the principles of life, the need for education, the hidden creativity in you, the courage and faith to uplift it and your efforts towards achieving success in life with the state of God's grace. Truly this writeup is wonderful because readers will be motivated to discover their talents and begin new lives altogether. The journey to success requires hard work, God's grace and self discipline. Dr Chikezie with this write up has shown us that it pays a lot to walk in symmetry of purpose. I think the most precious gift God has given us is time, once you know how to manage it, you are good to go. This is a wake up call not just for me but for my fellow students and our mentors in the upper echelon. Thanks for sharing this inspiring post with us. May God continue to bless you and also crown our own efforts. Let me start by thanking uncle Chikezie for this wonderful write up and Aunty Edith for her support towards our academics especially in character, spiritual life and learning. This wonderful writeup serves as a reminder and notifier for us to reflect on our past, examine our present and think of how our future will be...let's always be positive, do things accordingly and gradually and believe in God for positive change. Wow!!! Am so motivated by dis article... Thank God I read dis post... I really needed dis kind of inspiration n thank God I got it from her... Thank ma for sharing this post.. God bless u.
this is an inspiration. you hardly find young people of this generation who go the extra mile and work hard to be successful. thanks for sharing this aunty edith. i hope it also inspires everyone who reads it. Really, believing in oneself is a step forward to Success. And this cannot be done without the help of God Almighty, seeking His Guidance and profound Grace and living in His word. Reading this post is one of the best things that I've done in a long time. It's so inspirational and motivating. I pray all who have come in contact with this post not only just read through but gain its purpose. Amen. I agree with him when he said the younger generation wants to attain success without hard work. ...its unrealistic for we the youth to think that way bcx he is a living proof to what success can make you achieve! Thanks ma. This post really got me thinking, its not just interesting but also motivating. I read the post twice and felt it was actually directed to me. In achieving success, you need hard work combined with Gods grace and self discipline.Believing in oneself is another key which everyone must possess in order to achieve academic success .I have woken up from my academic slumber. Thank you Dr Chikezie for this motivating post, may God continue to enrich you with His unending blessings. To Aunty Edith, for sharing this post, God bless you. There is little I can say here. However, the lessons here for me - and many others too, I believe - are immeasurable. For sharing his life, God will increase this young intellectual, Chikezie. And for letting us in, ma, on this beautiful window to success, God will, surely, bless you. There is much education here as there is inspiration and something more that makes you hunger for success. Thank you a bunch, Chikezie and Edith Ohaja. "Here are my takeaway quotes from this piece: "Academic excellence is more than just achieving good grades; it is equally, maximum development of your intellectual capacities and skills." "…my discovery of what I was created to become." "I often would say that Christians who go to church to shout Hallelujahs and 'claim' miracles and breakthroughs and go home to sleep, are plain foolish." "Time spent on the Internet and social media robs us of the discipline and capacity to give attention to important aspects of our life. Time management is self-control…" "Going the extra mile means going beyond the norm, beyond what is convenient and ordinary. Stars shine at night and not in the day." "God is intentional with each and everyone of us because He takes care to build into us gifts and talents we would need to succeed in our life. Discover yours, and go to school to polish them." ......................................................... The reward for hard work is more work! Ndewonu!!! Am really blessed by this work. Thanks to both of u. May God continue to bless u and lift u higher. Am actually a victim of this shallow thinking that it is no longer “fashionable” to go to school; money can be made outside citadels of learning and money is what the world needs. But tank God for this post, I ave a better view of what education means now. And am going to work hard to use my knowledge for greater force in changing people's lives. Very inspiring piece....kudos to Mr Chikezie for giving us dz wonderful piece that is full of advice. The amazing thing is that he achieved all this within 30 years, such a young star of his time at least if not for anything but to correct dz popular notion or impression that achieving success and making money is all about doing business and not being educated. He also pointed out the weak points of students including me which got me thinking. We waste our time always on things of no value. The part I love very well is one of his quotes where he said that education is free on the internet but lack of desire makes it costly. This is so true cos we students lack the desire to read and acquire knowledge. Tanks to him for dz wonderful piece and thanks to u ma for drawing our attention to it. Bless you! An inspiring post. This post was actually directed to me, i had to read it over again. While reading i discovered that in achieving academic success, hard work, Gods grace and guidance is required. This post is really telling us to believe in ourselves, to always be positive and to manage our time well in all that we do.Thank you very much, ma, for sharing this post for it has really made me want to put more effort in my academics and believe in myself. This was indeed an inspirational one. All thanks to Ms Edith Ohaja and Mr Chikezie. A must-read for everyone aspiring for success in their academic endeavours. God bless you! I have read this post several times just trying to know if this advice will actually work for me. I can't help but notice that it will surely do because I do practice some of those things he mentioned. Students nowadays don't know how to create time for pleasures and their academics. Since the advent of digital technology, down to the coming of the social media and other internet platforms, we no longer have time for our studies rather we spend it on irrelevant and unnecessary things. If only students will learn to look up to all our scholars and intellectuals as role models and drop the idea of picking musicians and celebrities as role models. I believe our society will be able to provide more intellects in all fields of study and professions. Thanks dear Chikezie for creating time to share ur success ladder to us and the world. I pray God take u higher than u expect. Thanks Aunty for creating such a platform. It was really a pleasure going through it. Am elated to read an eye opening article as this. This has really challenged me as well as awoken me from my oasis of comfort. DR Chikezie you have not just inspired me but have also shown me the way through. I cannot but express my profound gratitude unto you sir, as for my loving, caring, wonderful and extraordinary mummy Ohaja, I say may God bless u ma for showing we your children the way to success in life. Shalom! This is really inspiring, Wow...this writeup has taught me how to manage my time effectively, recognition of divine presence which is d ultimate,mentoring which I never considered so relevant, what an achievement.....with God... I really bless God for ur life, Mr Chikezie. I pray that God keeps placing u above ur mates and always makes u a blessing to this generation...and that God will help me to apply these tips in my academic endeavour and give me the strength to achieve this.... Thanks ma for the privilege to have access to this writeup ... May God bless u more than ur expectations. Great inspiration. Thank you chikezie for sharing your experience with us, I really pulled out a lot of lessons from this. Friends and mentors don't run your race for you, they only show you ways to attain success. And true,people of this century always want short cuts to life but we don't know that there's always a price to pay. OMG! This write up was meant for me every part of it , sir this is spirit of God leading you to lead us am so overwhelmed by this post, I use to think that education in Nigeria here is a waste because we use 4 to 6 years studying and after everything we may end up doing opposite of what we studied so I thought to myself why the waste ,but with this post my head is really accepting n processing another thought ,I pray God direct us young minds to always do the right thing at the right time and not waste the time instead. thank you very much sir. I learnt a great deal from his write up it's really inspiring. I feel so inspired when I see young people attain such height. Another lovely thing is that God is also the bedrock of all he does. I will go home with all I have read now and I will strive to be a better me both spiritually and in all ramifications amen. Putting God first in all you do is a prerequisite to success because without Him, you cannot achieve anything. This post has inspired me in a very positive way and I hope to utilize its purpose in my life. This was really needed. As a student, sometimes you find it hard to balance and keep up with all the activities in life but this write up has really highlighted what you need in order to be successful and i thabk the writer for that. A very eye-opening post! This writeup has really motivated me to put efforts in my studies and to put God first in all my pursuit for academic success. I couldn't be more impressed! This is really an inspiring write-up. Discovering oneself is the greatest achievement, when you discover who you are, then you set a goal to becoming that wonderful person whom you were created to be. Yeah, social media platforms have posed more harm than good. How i wish the youth would always press the right buttons while on social media, because they are great citadels of learning. I admire your achievement, dear Chikezie. i pray with your guidelines i will do better in life. This is the Bomb! Now I have realised my short comings, am going back to the drawing board. Chikezie you really said it all. I have come to recognise where I have been going wrong. I love the part that says, "surround yourself with people who know more than you." It's indeed inspiring. Thank you mommy Edith. More Grace! To be sincere, youth and teenagers no longer want to work in order to attain success. Everybody wants riches on a platter of gold. Also, students no longer concentrate on their studies, rather they spend their time on social media and friends. The earlier people start to recognise what it means to be hardworking, the better for us and our society at large. Thanks, Chikezie, for sharing your opinion. This is an inspiring and motivating post!! I will really buckle up my belt. This is one of a kind. I am very sure those who kept wondering why their academic activities weren't yielding them the desired result will at least learn from this steps. They are short, precise and helpful. Thank you so much sir it was nice learning from you?? This article is a motivating and inspiring one, it opens our mind's eye to the fact that there is a shift from the conventional outlook we have about education in our world today. Also it's a wake up call not just to students alone but to every human that we must set a principle to guide our actions, not forgetting the God factor which emphasizes that faith without work is dead and nothing can be achieved outside of God. Finally the fact that academic excellence is not a congenital trait and also can't be inherited is so true. Hmm!.... This is really an educative and inspiring post, also a challenge to students especially those who take education for granted, who face it with high level of unseriousness with the notion that they won't depend on it for survival in the nearest feature. it depicts the right strategies, how to achieve the best in academic pursuit and also the need to always involve God in our academic life and virtually in all that we engage in in order to succeed in life. Indeed hard work pays, the number four principle is really effective as most times the topics i discuss with friends tend to stick more than the ones i just read on my own and also not forgetting the God factor. We can really do nothing without God's Grace. Chikezie, you are a great achiever and an icon to our generation. Thanks for sharing these principles. Aunty Edith, thanks for drawing our attention to this wonderful piece. Remain blessed, Ma. This is so inspiring. I'm also very touched that he knows God. Something a lot of us do: pursue goals and forget God. May God continue to bless him; and you Ms Ohaja. This is just what i needed to encourage me, this few days have been full of ups and downs, but then at some point i try to remind myself of the goal ahead. Indeed, hardwork is the key to academic excellence but God must always be involved, this has motivated me to set my path right now its not too late, this achievement is amazing and i'm happy i had the opportunity to read this. Isolation seems quite challenging to be sincere, but i must try this principle and as for mentorship i've never thought of it, but i must try. Wow! This write-up got me I must admit. Practice Isolation amongst others struck me most... I discovered through time that this actually works... It's in one's serene time that one can get direction, know how far or close one is to fulfilment of life's plan, and most importantly, God's plan ... Seeing this point gave me hope for not giving up on it! This piece is worth sharing to youths out there who have lost track on purposeful living... Thank you Ma for sharing this post with us.. And thank you Sir Chikezie... For letting us into your secret... I have been blessed. A big thanks to you Ma for letting us have access to such a beautiful post, and I pray God to help we the younger generation to achieve our goals by working hard and I pray God to strengthen us. Amen ?? "Stars shine at night and not in the day. If you desire to be a star, then you must get ready to shine in the night, to work hard when others are sleeping, when others are seemingly enjoying life." This part really got me. I'm so inspired right now and this post has really got me thinking. Thanks for sharing Ma. God bless you. so inspiring, i learnt a lot from that article. Mr. Chikezie. you have really made it in life. indeed it pays to work hard. congratulations and i aspire to attain the same height by God's grace and my hard work. Thank you for this beautiful post. Though, i don't believe that the path to success has to be a lonely one. I believe so much in the support that family and friends bring in hard and challenging times. God bless you Sir as you have really offered a lot to me through this great inspirational work of art. I must confess that I'm touched by your words and experience. I learnt a lot from it. But the most important thing is putting them in place. Just as you said Sir, it now seems normal for youths to pursue money in a wrong and stress-free way which is not good because even the Bible Says: for food to be on the table, you must work hard. Thank you Ma, for giving us this platform to learn from this piece. Bless you Ma. The lessons here are enormous for 'great minds'; It is indeed an eye opener to me on some aspects of my life. Glory to His Name for an opportunity like this. Wow. This is educating. Quite an eye opener. Am going to try out some of these. Thanks Ma for sharing. hoarding of knowledge is a major issue in our society today especially in school. not knowing the grt secret behind it which u exposed in this work. many people have great knowledge but finds it difficult to share it, i believe that if there would be a change in their mentality, our nation at large would be a grt one. thanks so much MR! This inspiration message is an eye opener, which will help this 21century generation to understand that life is step by step, education is the key to success, either former or informal education, and the education you acquire at the process of learning a skill or in the class room. prayer without hard work leads to poverty, and the friendship a man keeps determine how far he will go in life. "If you desire to be a star, then you must get ready to shine in the night, to work hard when others are sleeping, when others are seemingly enjoying life." I think this sentence covered it all up. If you want to be great in life, you have to work very hard, don't get distracted from what you want to achieve and put whatever thing you are doing to God in prayers. Money is not everything in this life you have to be wise and educated in order to know how to manage your money. Thanks, ma I pray that God will help me to put these pieces of advice into practice. Education has an upper hand than money, education comes with integrity, values and importance. God please help me stay in track in my academic pursuit. I am tremendously inspired by this awesome piece.And the fact remains that no matter what Education will always remain the key to a better brighter future.Thanks Aunty Edith for sharing this awesome piece. This article is too good to keep to oneself; it deserves to be shared. It is a must-read for youths, students and any person who has focus and vision in life. It is inspiring, thought-provoking, edifying and even entertaining. This is one of the most interesting and arresting articles I have read this year. All thanks to the writer and Aunty Edith who made it possible for us to share and gain from this article. I sincerely love this! Good Bless you,Ma. You are simply awesome!! This is very nice and educating, interesting to read too.Thank you for choosing to share rather than keeping it to your self. May God bless you abundantly. ...Feeling inspired rn, thank you. I must confess my gratitude for this all important post. This is a piece that creates in itself a spirit of assured excellence. I must read over and over again. To be sincere, I need this every morning. Saying thank you will limit the magnitude of my gratitude. God bless you ma. Only those who are successful can give practicable success tips. What Chikezie said is not Oven Fresh but carries weight because of whom he has turned out to be. Most times we see, hear success tips but we dont get spurred because it didnt come from seemingly successful people. Thank you Ma. This post is really a brainchild of experience. I would have missed a lot if I didn't savour this post. Thanks ma for this caring opportunity. This post is really needed especially now that education is being replaced with ambitious jostling for money. This post is really an assurance that education is a major key to success. Students do lose focus oftentimes because of their inability to manage their time. Whatever is worth doing is worth doing well. I am encouraged and motivated. Thanks a lot for letting me come across this lesson. Bless you! Wow this post will really help to excel in my academics.this post make me to understand that education is the best and to be successful one need to be focused and work hard. People want to be successful without stress. They want to get the glory without understanding the story behind the glory. Indeed, there is no short cut to success.Thumbs up to the author. A very inspiring and motivating post, the post tells us the True definition of education and how to Excel in our academics. Thanks to Chikezie sharing his success story, we are left with noting but to work harder in our academics. Hardwork pays no matter how difficult the circumstance is, most people use their situation as an excuse for their failure. Between Failure and success is but a thin line and a matter of choice....if you study hard, your efforts would be crowned with success.....this post is a deliberate example we all should learn from. The post is highly motivational and inspiring, no shortcut to success. This is such an amazing post. He actually buttressed what's happening in our society today. People looking for a stress free life and the fastest and easier way to make it in life instead of working hard and doing things the right way. This post has really motivated me to be hardworking and also look up to God for his grace and favour. Thank you Dr. Chikezie for this motivational post, may the lord continue to shower his blessings on you. To you Aunty Edith, Thanks for sharing this post, May God continue to bless you too. This is very inspirational and motivational, after reading this I want to wok harder, a vey good write up for the youths and student , we have to work very hard to achieve success in life achieving success is not an easy thing, but when we work for it and ask for Gods grace then its possible. Thanks alot for sharing your success keys for academic progress. I must say this post has been of help to me. This is a lovely and inspirational post. Atleast, I learnt some vital secrets of success and most importantly the act of drawing close to God;not neglecting him in any endeavour and also the act of thanksgiving. Wow!This is a motivational piece, which triggered my sense of reasoning. ..Education is the key to success and anyone who want to be successful must first of all take the business of eduaction very important and vital...To my lecturer, tnx for the access to this niece post.And to the author of this great piece, may Almighty God continue to bless you.Amen. Wow! This is insightful. I'm blessed to have read this story today because I have 'serious issue' with procrastination. This story in a way "gingered" my moral. God help me!!! What an inspiring piece that triggered me. Hard work pays no matter how difficult the situation is. Thanks a lot for sharing your success story. Very inspiring piece and especially useful in times like this when young people are vying for other means to succeed outside hardwork and faith in God. this story is indeed an evidence that young people can succeed without shortcuts. Am deeply blessed by this post. I was mostly touched by the fact that " Time wastage occurs when there is no vision and focus. When this happens, time becomes a burden, instead of a tool" as i am really a victim of this. I start wasting my time the moment i lose focus or direction of where i am going. 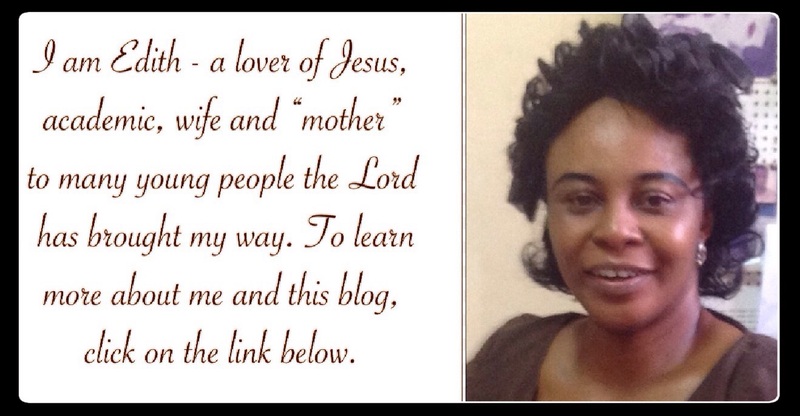 God's blessing to you, Aunty Edith, for the wonderful opportunity of reading this post. Am inspired to go for excellence. I am so glad I came upon this post it is so inspirational. This is surely an eight points agenda for Success. The one that struck me hard is going the extra mile. That is truly what sets one apart. Most times, students limit themselves to reading just what the lecturer gave and don't bother about further reading and research into meaningful things. This post is full of inspiration and I truly see a change coming in to my Academic life. Congratulations to Chikezie for all he has accomplished at such a young age. These are the words of encouragement I need this exam period. God please help me, I need your grace. I promise to put in more efforts. This is more than a sermon preached in the church,This has many lessons that can reshape our minds for a greater measure of thinking for excellence both in our academics and beyond. God has really blessed you chikezie and in appreciation, you chose to share this inspiring message to us through our mother in the department. ma i thank u for this post. Lord please help me to achieve my own academic success. Waaaaawu am so motivated by this article. I strongly agree with the writter, because there is no success without hardworking. Most of us have dreams but afraid to pursue It because we are afraid of failure , most of us don't even know who we are created to be and why we want to go to school. Wow, the contents of this article are beyond the title. It offers more beyond what title tries to portray. It is like a secret or idea for Academic Success. I am Happy to have benefited from the wisdom, Idea, that were deployed in this article. Our Aunty cannot be thanked enough for sharing this invaluable article with us. I love this. God bless you , Ma. I will adopt these principles in order for success to pursue me. These are truly wise words from a wise man. Thank you so much for sharing, Ma. Academic excellence is more than just achieving good grlades. It goes beyond this to developing one's intellectual capacities and skills. There is never a short and easy road to success or excellence. This only goes to show that academic excellence comes with a price that must be paid by anyone willing to achieve it. This is interesting and educative . Is a privilege to have such a lesson that would cost me but here i am able to access such wisdom without any payment through Aunty Edith. Thank you ma. This article is what helped a great man and to be wise is to learn from a great man those things that helped him succeed and even use his words as a background to becoming better. This article is a challenge and motivation to me. i had too think again about the first question: "What my purpose is and why i came to school? The education morality that is dropping as a result of few people's opinion that "education is no more the key and has fade" as believed by most youths of 21 century. Hardwork and God's grace work together has been abandoned. Youth wants to only make it "sharp -sharp, short-cut" without hardwork and education as a priority rather most people see it as a substitute. Most people do not want to be disciplined in isolation, communication, time management. This is a great article that been written and presented to us, to help us change our bad attitude and negative mindset. This article is presented to help change that laziness among youth and motivate youth to do more than they are producing now. Thanks Mr. Chikezie for sharing your principles and map to the youth. I have just one thing to say....this. Is extremely inspirational. Chikezie is an academic scholar with excellence. I picked a lot from all he wrote and will definitely put it to good use. Thank you ma for the opportunity to come across this great piece. This is so inspiring and challenging. Nice post. Being successful involves great sacrifice and discipline. Some people are very much interested in jumping into success without preparing for the challenges involved. This note inspires and motive us as students, reminding us that it's about time we realize that there is no short cut to success, there is always a price to pay. Success requires going the extra mile, denying yourself of some pleasure and it takes only a determined person to do so. Thanks a lot ma for sharing this post with us. Education is indeed a powerful tool to rule and conquer the world. i feel inspired and blessed to have read your story of how your hard work finally paid off in the long run accompanied by God's grace and mercies. it is important for us students to work hard now so that we may enjoy the fruit of our labour tomorrow and so that our parent's labour and hard work won't be in vain and of course we should not forget the most important factor which is the God factor, because through him all things are made possible. Going an extra mile to get things achieved, breaking out of that comfort zone to reach greater heights, getting educated and not using flimsy excuses to back you giving up, hoarding of knowledge and so on as contained in this article is a 5star rating for me. One really needs to be enlightened on some certain academic issues and you ma, have done justice to to that. Education is patient and patient is the best weapon to power, education makes you exposed to the outside world. It keeps your mind constantly on The road to success. It is not easy though nothing good comes easy that's why patient is very important in terms of going the extra mile. This work is captivating and motivational. when i read Mr. chikezie's profile, i felt challenged and i decided i wanted same things for myself. it is nice that Aunty Edith finds it worthy to share some in-depth insights with us; these set of principles will certainly take us to the heights of our dreams. as students, we are always interested in seeing people who are making a mark in any industry not linked to entertainment. if he can make such awesome track record then there is no stopping us. i pray that someday other male and female "chikezie's" will find their way into this blog for one big achievement or the other. the sky is our stepping stone. The Dr painstakingly hit the nail on the head. When one discovers who he was created to be and why he wants to go to school and engineers his dreams by embracing hard work as well as learning how to manage time, the sky will definitely be his starting point. Mentorship is good for those who would find ideal mentors. What a eye opening this is. Today's youths puts more relevance to non academic pursuit for things that gives quick money. It's true that academics interest is of decline but also true that 15years from now people that are not intellectually equipped will struggle to fit in, in the nearest future. I must say that those who are lucky enough to read this article and implement these principles will be successful. Thanks a lot Chikezie. What wonderful tips for students, it is very motivating, most youths nowadays prefer shortcut to achieve their goals or to be successful in life which is not right, there is need for hard work and dedication to achieve success in life and also God factor is necessary ,as Christians we need to put God first in everything we do. Am indeed inspired by chikezie uzuegbunam. he woke me up from my intellectual slumber. what an indeed motivating and inspirational write ups. Thank you and God bless you. Chikezie I call you a God sent for this word of advice you have given to the teeming youth predominantly Nigeria’s youth who their slogan is “Any way na way”, who so much believe on short way to get money whereby bargaining their Education with money, especially, the so call G Boys who purposely forfeit their academic activities just to dupe people and get money instead of knowledge before money. I believe if the majority of the youth can have access to a piece of advice like this, it could be said that the dubious mind set of Nigeria’s youth will drastically change thereby reducing the rate of corruption in Nigeria and Africa at large. Omg! This is the most captivating article I have ever read. The relevance and importance of school have been devalued but with the help of this, I strongly believe that the dividend of schooling will definaately pay in the long-run.. Nice one CHIMIEZE! This is life not just an article. I love the fact that you said one have to discover himself. In fact that is the first stage. Discover your God given potentials. God made each individual unique. The ability to discover yourself is the pathway to success. We have great potentials in us but until you discover them you are bound to remain the same. Not just discovering your purpose but also have a plan for your life. Strategize ways in which to attain some certain goals. Be determined, follow a schedule, develop self principles, and most importantly never look down on yourself. You have a worth. Have a good mentor, one that shares a similar vision with you and respect the person. Put yourself away from the crowd but never look down on anyone remember no man is an island. Thank you Mr Chikezie I have been deeply blessed with this article. And thank you ma for laying this platform remain ever blessed. Thanks for the tips, it is really motivating and inspiring, I mean as students we need to make use of the internet very well, in terms of academics, we also need to do the right thing at the right, most people prefer the shorter way in life but it is not so, like you said, we need to be hardworking and dedicated in whatever we do. Thanks for sharing ma. We don't know what education cost when we are into it, it is when we are reaping the fruit of its labour is the time we will understand it matters a lot in our living both consciously and unconsciously. The story of Chikezie has every means to encourage us not to lose hope but to go ahead no matter any situation in life. Thank u MA for this article is very motivating and inspiring. God bless you. Ours is a generation of shortcuts and of unhallowed hastiness - this statement has a lot to say about our personality as youths in this generation. Most of us want shortcuts to success and achievement that's why some indulge in hideous practices and devious ways to make money. I pray God helps us. Ours is a a generation of shortcuts and of unhallowed hastiness. - Chikezie Uzuegbunam We should always keep in line with our mission, vision and ambitions on earth, our greatest desire is to be in line with what we want so with this we tend to follow our passion. The principle given by chikezie is indeed a nice one, I love to watch Ted which tells me more about people's story which indeed tends to motivate me to go the extra mile. Thank God for this piece, indeed I have learnt the secret principlles to achieving greatness. Nice work for you chikezie. Thanks ma for this motivational piece. Ben Carson summarised his secret of Success - academically and professionally - into THINK BIG. This time around, it's another insight into the secret of yet another young mind in the academic world. It's a quite inspiring piece! Motivational, if I should say so. It's high time students should sit up and carry on the cross of success - it might not be easy. Nothing is ever easy. To the students out there, we ought to ought to understand that education does not end in classes... It's never limited to classes. You're undergoing such trainings today in order to prepare for the future. This success tips spans beyond even academics.Though our generation goes the shortcut way, i work towards been among the few who don't. This is worth pasting on marble and visited daily. Thanks for such wisdom. Discover who you are, and when you find the vision, work hard towards making it a reality. Miracles don't just happen overnight, it takes a lot of hard work. We may struggle hard and face a lot of bumps and hurdles on the way, but God still got our backs. This is an entirely enriching post! extremely informative, didatic and worth a read. indeed a lot of youths today have disregarded and ignored the enormous benefits academic excellence yields, a lot of them are in hot pursuit of the liquid cash, irrespective of whatevere way this pursuit is carried out. indeed, gone are those days when, academic excellence was the most sort value/asset. The youths of today are after the wads and wads of cash. no one values the classromm anymore not to talk of the thick covered textbooks. Alas! Education now has little or no value/significance before the today youth. Everybody wants to be recognised based on the number of cars, houses owned. And funny enough, these youths in dire need for these possesions are not really ready to work/toil to get them. God will crown our efforts with success. Education is power. Knowledge is the key to success. This post is motivational.God bless you. The impression that education is a wast of time,energy and money is really appalling...education as they said is the key to success,so as a youth, you have to develop passion for education for you to attain greater height. I have learned a great deal from this post. All the points he gave are very useful. Prayer without hard work will surely lead one to no where. But, hard work with prayer will always bring about success. At least, you don't end up working hard for nothing. Woaw! This post brings inspiration to the soul, most of the points here are extra relevant to any student that wants to achieve greater academic excellent. The most controversial of all is Time management, it has eaten deep into our educational system, one can spend a whole day on social media but could hardly spend an hour on his/her books. Keeping friends isnt that bad because it depends on the kinds that u keep, friends can actually be your source of inspiration at times so you need them around. Have to learn alot from this post. This is a real eye opener for all students who can't seem to do things right in order to achieve academic success. These principles are highly recommended and strategic. Thanks ma! Finally someone has put us back on track.For us to be successful, we must work hard and be ready to face all academic crisis. With God helping us, we can succeed beyond what we expect. Whoa! really inspiring. All those accolades, well its just a starting point. The combination of Gods grace, hard work and self development is just what we need to become successful in this our modern society. Thank you aunty for your continuous doses of inspirational materials like this. Indeed, this post is full of success principles and tips. The place I like so much is where Chikezie advised that we share our knowledge. I have always done this, and my knowledge increases as I do it. I encourage others to teach their fellow students when you know that they don't know it nor understand, but you understands more. Thank you, ma,,for posting this article. It actually encouraged me. Wow....... This is an eye-opening inspirational post and the item I so much love is that it is good to teach others what you know so that you will learn more. Thanks so much, MA, for sharing this. I appreciate. Without doubt, education is the most important tool for success and academic excellence is the most important tool for even greater success. It is refreshing to always find great minds ready and willing to stand for academic and educational excellence. In this life, what people want is to get rich quick without knowing that education is a necessity education goes a long way in human life. Therefore, it is important to be educated. I am going to put these principles to work right away. I have learnt from this post! This is awesome!!!!!! This inspiration I get here will really help to excel in my academics.this post make me to understand that education is the best and to be successful one need to be focused and work hard... God bless u abundantly Chikezie Thank u, ma, nd remain blessed for sharing dis post. Let's all emulate him and strive to do more than what he did. Hard work plus the grace of God is an express way to success. This is post is really inspiring, I just noticed I ve not been doing some things right as regards to my education, the principles he mentioned are similar to other scholars principle and they re of high value. One true fact I learnt is that academic excellence is not congenital but worked out cause there has been recorded cases of academic dullards becoming excellent scholars in future. I really love this guest post by chikezie. it's a very inspiring one. it is true that we, the contemporary youth don't want to pass through fire but we want to become golds. However, I pray that God gives us the kind of zeal and enthusiasm that will spur us into doing the right thing at the right time and cease to be distracted by unnecessary things. Quite motivating! I learnt a lot from this…To add to what he said, involving God in our academics goes a long way in helping us. Hard work leads to success. Sir Chikezie, I tap from your grace of excellence. Thank you, Sir. Keep soaring! This write up has really taught me so many things. I have not been doing somethings the right way especially things concerning my academics. Thank you Ma for the nice post, God bless you. our generation unfortunately is that of shortcuts and Unhallowed hastiness. as he said, we want it as quickly as it can come. we fail to remember that without hard work, there will be no success. I implore our youths to follow the foot steps of Chikezie, he has put out a lot of points to help us.. This is really motivational, it is important to know that there is no success without struggle. To achieve success I have to go an extra mile. I am glad and motivated. This is a must read for every student aspiring for success in their academic endeavors. I am happy to have benefited from the message.God bless you ma for sharing this message. Practising isolation? That seems a bit hard to accomplish, well a try won't harm though. i salute you, Sir. More power to your elbow! Education, dilligence, hardwork, committment, time management... Education is important and I agree. I In a country like Nigeria where graduates search for jobs. First class students roam the streets only God's grace can carry you alongside all these values. The road to success is a lonely journey which requires hardwork and determination..I'm kind of short of words.. Thanks, sir. One consequential thing I learnt from the writers perspective of principles of success are, first discovering who you are and what you want. Secondly working extra mile to achieve success. If students should follow these principles propounded by chikezie uzuegbunam success will truly be achieved, Because they say, pay's. "Fail seven times, get up eight" Failure is not trying, but quitting. Thanks so much chikezie for this wonderful piece. It's indeed an inspiration. Indeed wonderful to note that intelligence And success is not hereditary rather it is being worked out. We should study to learn and equip ourselves not to pass or get certificate. Intelligence is hereditary but it doesn't always determine how far you get in life. Someone of less intelligence can go farther than someone of higher intelligence if he applies himself/herself more to study and general diligence. Yes of a truth these principles are what embracing. If there is one thing amazing about it ,it is that God is involved .also time management ,knowing the reason for existence and why am here in school . thanks bro it is mind blowing. Wow! What an enlightening topic. I really learn a lot and I will put all I have gathered from the topic into use. Thanks again and God bless you. Chikezie Uzuegbunam's story, is undeniably factual. Before he proceeded to giving us his success tips, he stated clearly that he wasn't going to "sugar coat his words." As difficult and unconventional as they appear, they are however true and real! There's no denying it! And best of all, they come from a man who has obviously made it real big! We may come across success stories and tips from just about anywhere, but the ones from the truly successful people? Now that's not too easy. Thank you very much Ms Edith Ohaja and Mr Chikezie. Your story, is a motivation for me! The importance of hard work can not be overemphasized. His story serves as a motivational one to youths who seek to be the best. I prey God helpsbusbto use our time wisely to work hard and get desired results. Chikezie's post is a recipe for greatness. I concur with him when he said that without hard work success remains a mirage. I've never seen nor heard of any successful person that is lazy. I must confess that Chikezie's post is both encouraging and interesting. It has opened my eyes to the areas where I have missed the track. This writeup really struck me. I used to think that for one to be successful, he or she must be sociable enough. We students also lack time management and this has really caused us to fail in some cases. Chikezie thank you so much for this writeup. Now I know that the pathway to success is a lonely one indeed. Not many people who are in your life right now would contribute to your success. Some would try in every way to see that you don't succeed by distracting you, while some would help you to be successful. Extremely Inspiring!! !.....I learnt that in other for us to achieve our dreams we need to be hardworking!!! This post is as rich as I expected. The guidelines are practical. I will post them in practice and pray my academic performance changes significantly. I pray God help me. Thanks for the post. Of a truth, success is indeed a lonely journey. The ball is in our court. As we lay our bed, so we lie on it. This young man made a possible attempt without looking back nor being discouraged, he applied the formula of forward ever and backward never. He knew that his success would make him excel in life. I love the fact that this post gave us the reason why we should work towards achieving our dreams as students. Many people out there has lost hope that they can never achieve any single good thing in life due to they think that "not all people has equal destiny" therefore they can't Achieve anything. I agree. Till today, my roommates still believe formal education is a waste of time claiming "learning a trade or business indulgence would earn more and less stressful". Once they looked up my "supposed" salary and laughed. So I agree with you when you describe them as; "a generation that is unprepared to play by the rules; a generation of impatient people"